Weary or bitter or bewildered as we may be, God is faithful. He lets us wander so we will know what it means to come home. Marilynne Robinson’s novel, Home, returns to Gilead, the fictional Iowa town that served as the setting for the novel of the same title. The return brings mostly the same characters, though the setting for most of the story shifts from the home and life of John Ames to his best friend and fellow minister, Robert Boughton. The story revisits and expands on the final episode of Gilead when Boughton’s troubled son, Jack returns home seeking forgiveness and the peace that has eluded him for his entire life. One of Boughton’s other children, Glory, has also returned home, ostensibly to care for her deteriorating father, but also because her own relational life has crashed and she needs a place to recover and restore. Jack isn’t forthcoming with details of what has happened since he left, nor what has brought him back home. Bit by bit, piece by piece, the reader learns of Jack’s troubled life and of finally finding love and family, though home still eludes him. Glory, still sorting through her own shattered dreams of home, does her best to smooth the way for the repair of the breach between Jack and Papa Boughton. Papa Boughton genuinely tries to understand, a task made much more difficult by his son’s unwillingness to tell all. Still festering is a wrong from Jack’s earlier life that is still unresolved and for which Jack, ultimately is unwilling to acknowledge or for which is willing to take responsibility. Forgiveness is not easy. It’s is not a one-dimensional. Forgiveness given can be retracted in a quick word of judgment. Intentions to forgive can be blocked by the difficulty of letting go of the transgression that cause the rift in the first place. And one can be offered forgiveness without the ability to receive it. Is reconciliation possible if the burden of transgression is so great that one cannot ever let go of it? If home is the place where full acceptance and pure love is to be found, then I suppose none of us really ever find home. Probably, that’s simply too much to ask. Maybe home is, instead, the place where we work at it, a place where our best selves try to lay aside judgments and resentments, a paradoxical place of both warmth and struggle. Home is a place populated with skeletons of hopes and dreams unfulfilled and it is also a place were we occasionally find deep love and acceptance. It’s also the place where fathers and mothers recognize their own brokenness and failings, looking with hope not just to their sons and daughters, but to their sons’ and daughters’ sons and daughters. What Jack came home looking for ultimately eluded him. As his sister caught a glimpse of what had almost been in his grasp, she comes to a moment of clarity and peace, realizing that at least for now, for all her wanderings, weary, bitter, and bewildered, she is home. 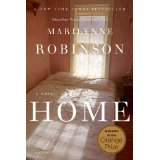 This entry was posted in book reviews, Uncategorized and tagged forgiveness, Home, Marilynne Robinson on January 19, 2015 by Jim Honig.